Japa | Hari Sarvothama! Vayu Jeevothama! The very auspicious Adhika Masa is starting tomorrow. As we are all set to start our austerities, here comes an excellent talk in Tamil on Adhika Masa Mahima and Anushtana by Sri Lakshmipathiraja. 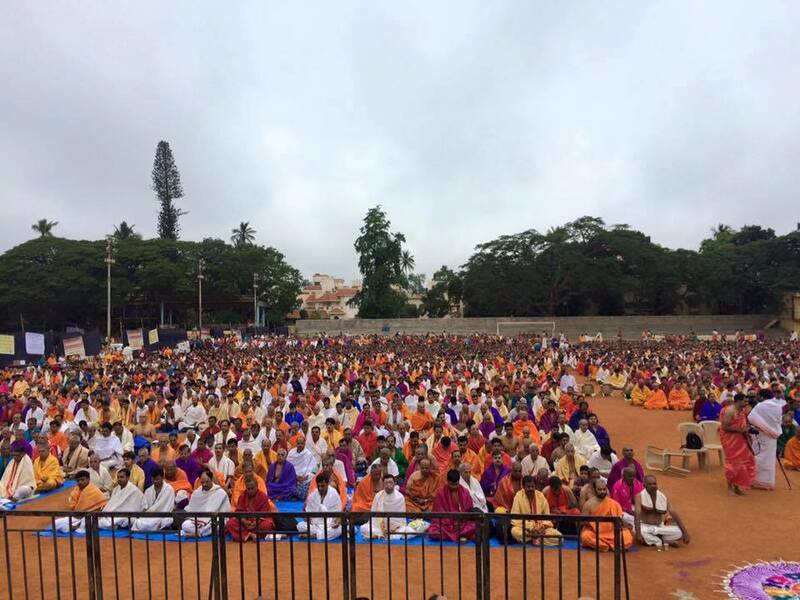 Here comes some great news from Bangalore to make best use of the upcoming Akshaya Tritiya day. 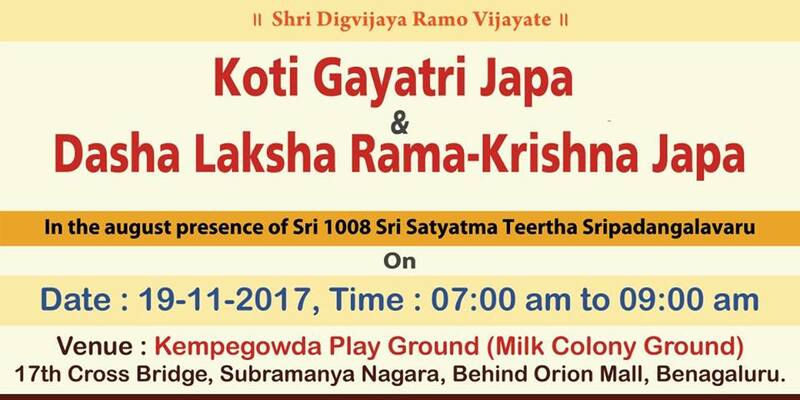 A Gayatri Japa / Ramakrishna Japa event is being planned on 18th April, Wednesday at Sri Digvijaya Lakshminarasimha Swamy Temple, Uttaradi Math, Basavanagudi, Bangalore from 8 to 10 AM. Any thing we do on Akshaya Tritiya day is said to grow, and nothing better than Japa in the divine presence of Srigalu Please pass on this message to your folks and let us all get together and make this event a grand success. Here comes some great news from Bangalore. 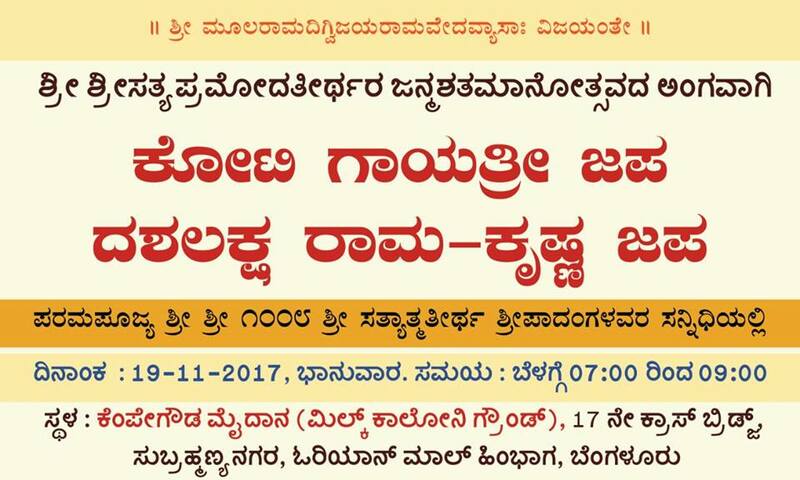 As a part of the grand initiative of Sri Sri Satyatma Theertha Swamiji, a Koti Gayatri Japa event is being planned next month on 19th November, Sunday at Rajaji Nagar, Bangalore in the inspiring presence of Srigalu from 7 to 9 AM. Ladies have an opportunity to do Rama-Krishna japa. Please pass on this message to your folks and let us all get together and make this event a grand success and experience the spiritual bliss!!. 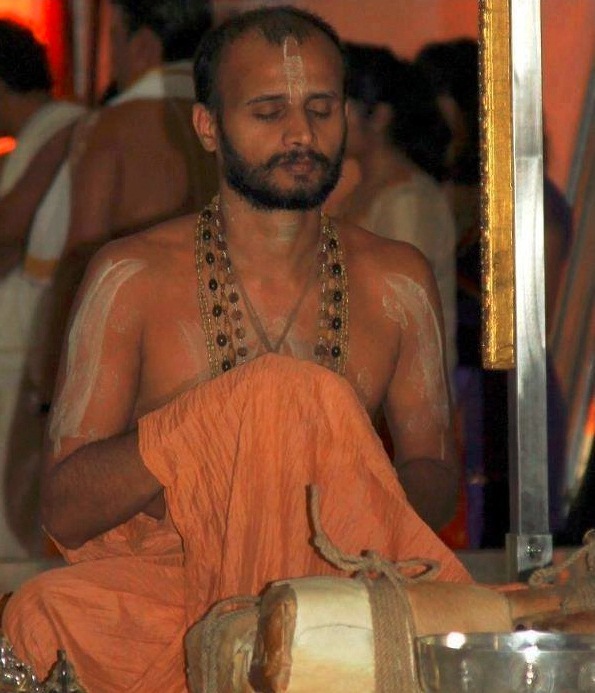 Sandyavandana and Gayatri Japa are mandatory and very very important for us and one must do everyday without fail. Here comes a 3 part series pravachana on Importance of Sandyavandana by Vidwan Sri Krishna Raja Kuthpadi. Sri Kuthpadi is a young scholar par excellence and has graduated from Poornaprajna Vidyapeetha under the guidance of Shri Pejavar Swamiji. Here comes some great news and an opportunity for us to get a head start for the forthcoming auspicious Chaturmasa kala. 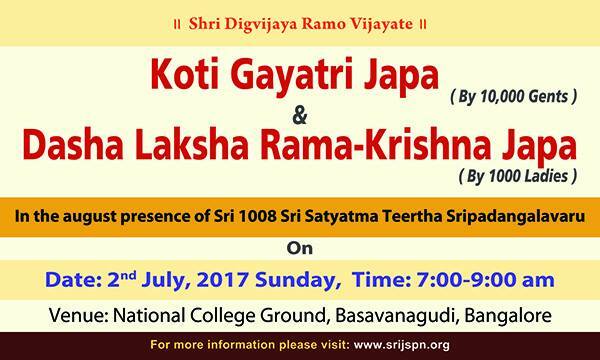 As a part of the grand initiative of Sri Sri Satyatma Theertha Swamiji, a Koti Gayatri Japa event is being planned this year too on 02nd July, Sunday at National College Grounds, Basavanagudi, Bangalore in the inspiring presence of Srigalu from 7 to 9 AM. Ladies have an opportunity to do Rama-Krishna japa. Devotees are requested to be present in the japa venue by 06:30 AM. Please pass on this message to your folks and let us all get together and make this event a grand success and experience the spiritual bliss! !.